I’ve been playing a lot of Destiny lately, and while it’s a shooter at heart, it also has a loot system front and center. You kill stuff and do missions to get loot, which makes your numbers go up, which means you can kill tougher stuff and do harder missions to get better loot, and so on. 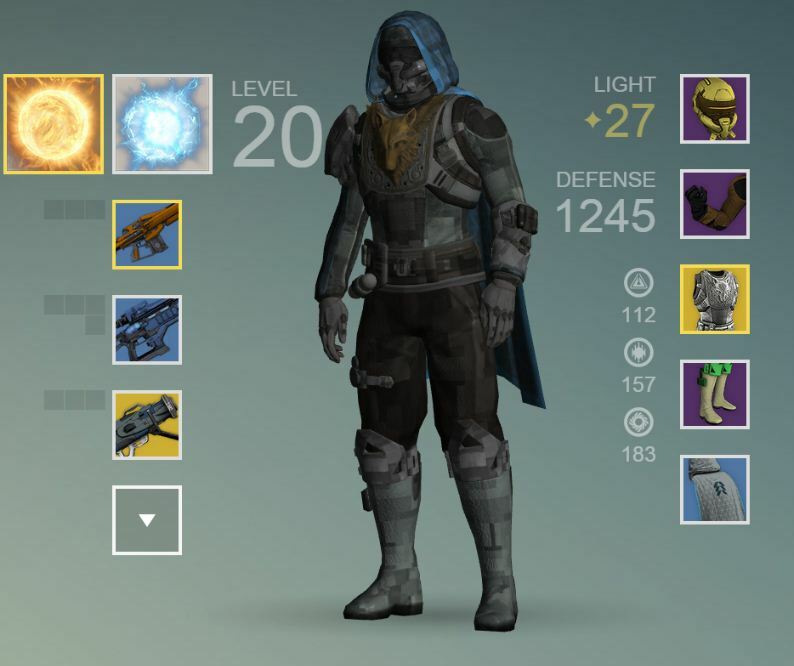 Destiny even has the standard loot color codes: white, green, blue, purple, and yellow in order of ascending quality. 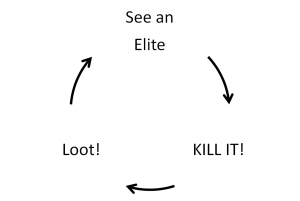 I’ve been thinking about the psychology of Destiny’s loot system and how it compares to other games. I think they’ve done one thing well and one thing not as well. Let’s look at something I think Bungie’s designers flubbed on first. My hunter and his hard earned gear. 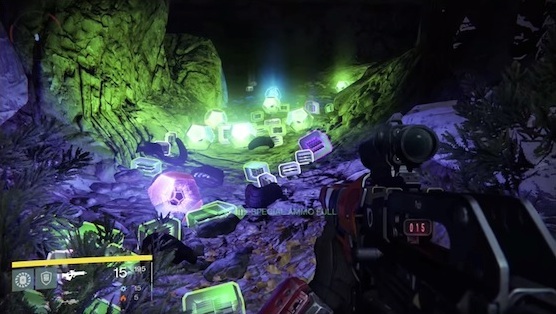 Destiny’s fabled “loot cave” (see footnote) is a direct result of the missing step in Destiny’s loot loop. But all is not bad on the Destiny loot scene. The game does one interesting thing that I think may actually make players happier with their loot drops. Even if it’s a bit counter-intuitive. In 2007 Jaime Kurtz, Timothy Wilson, and Daniel Gilbert did a study on how uncertainty about rewards affects how happy people are with them.4 They had individual subjects come in to do a task, but before they got started the researchers said that subjects would win a small prize (e.g., a box of chocolates or a coffee mug) if a spin on a roulette wheel favored them. In reality, because all psychologists are compulsive liars, the wheel was rigged so that everyone was a winner. The trick was that half of the subjects were told immediately which of the prizes they would get at the end of the experimental session. “You’ll get that box of chocolates you wanted when we’re all done today!” Other subjects, however, were told that they would get one of the prizes, but they wouldn’t find out exactly which one until the end of the experimental session. So it’s like one group got to identify their loot immediately, while another had to wait until they could go back to town and have Deckard Cain identify it. Which group do you think was happier for longer according to self reports of mood via questionnaire? Turns out it was the ones who didn’t know which prize they were going to get. One reason is simply that the reward is stretched out over time. Another is that we tend to adapt to positive (or negative) emotional experiences fairly quickly so that they level out, which is harder to do when we don’t know the specifics of a windfall. 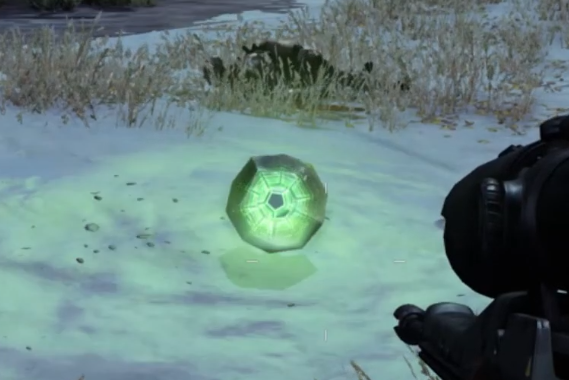 An engram in Destiny. Image courtesy of destiny.wikia.com. Now, if you will excuse me, I need to go complete the daily strike mission so I can upgrade my exotic chest armor. See you online. 1. For more on habit loops, see Duhigg, Charles (2012). The Power of Habit: Why We Do What We Do in Life and Business. New York: Random House. 2. There’s also the whole random element of whether you get a reward and how good it is, but I’m not going to address that here. 3. This is why, by the way, the “loot cave” farming practice evolved. This is when players would continually fire on enemy spawn points for hours on end just so they could brute force the random number generator and get some good rewards through volume of drops alone. It’s a direct byproduct of what I describe above. 4. Kurtz, Jaime, Wilson, Timothy, and Gilbert, Daniel (2007). Quantity versus uncertainty: When winning one prize is better than winning two. Journal of Experimental Social Psychology, 43(6), 979-985. 5. Note that this is only true since the latest patch, where Bungie fixed the system so that purple engrams always produce at least purple loot. When the game first launched, that was actually a rarity; you were much more likely to get a worthless green or blue from a purple engram. It was awful, but thankfully Bungie fixed it. I believe you are familiar with Nir Eyal’s book called Hooked? He does a fine job explaining the importance of variability (it’s much more impredictability) when it comes to rewards for digital habit products – which is precisely what an MMO is all about. Diablo 3’s auction house destroyed the craving for the reward. Any player sooner or later would find some loot, but ultimately knew he could find infinitely better and cheaper loot at the auction house. And thus D2 was just more enjoyable than D3. Yep, Eyal’s book is a good one too. I totally agree about the AH in Diablo 3. It undermined the entire loot mechanic of the game. Playing the auction house was not as much fun as playing the game, but everyone did it because it was more efficient. Why do you ground these posts on popular psychology books, as opposed to the literature? It bemuses me that you could get through this post without a mention of operant conditioning. While it’s clear that a ‘habbit loop’ is in function of operant conditioning, that isn’t very well explained here. This is interesting. The habit loop is true. I think time should be considered. The more times the reward does not match the time spent completing the behavior, the less impact the cue will have. Take a traditional habit loop with “tall grass” as the cue, “mowing the lawn” as the behavior, and “payment” as the reward. If the payment is sufficient enough to justify the reward, the cue is remains enticing and motivates one to perform the behavior. 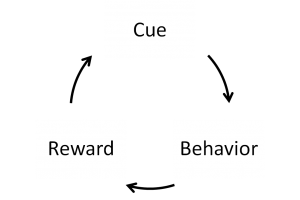 The more times the reward doesn’t justify the behavior, the less likely the player will be motivated by the cue. This is multiplied when the behavior is made to consume more time. Now time has become a factor within the behavior to justify the reward. Destiny, in my opinion, failed the cycle there. The time and difficulty of the behavior no longer justifies the high risk of being consistently rewarded below par and with a seemingly non-existing cue. Players are unhappy and feeling like the time performing the behavior was wasted. What’s your point ? You some kind of bible thumping Christian ? Pingback: Is Overwatch Overrated - or the Greatest Shooter Ever?